KIDS FIRST! 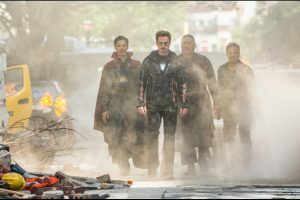 News » Blog Archive » ​​Avengers: Infinity War – Truly Worth the Hype! This will Blow Your Mind! « Rampage – What it lacks in complexity, it makes up for in pure spectacle and fun! 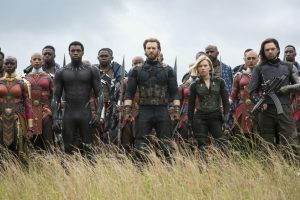 ​​Avengers: Infinity War – Truly Worth the Hype! This will Blow Your Mind! As the Avengers and their allies have continued to protect the world from threats too large for any one hero to handle, a new danger has emerged from the cosmic shadows: Thanos. A despot of intergalactic infamy, his goal is to collect all six Infinity Stones, artifacts of unimaginable power, and use them to inflict his twisted will on all of reality. Everything the Avengers have fought for has led up to this moment – the fate of Earth and existence itself has never been more uncertain. KIDS FIRST! Film Critic Calista B. comments, “Wow! Just, wow!! Marvel Cinematic Universe has been building up to this movie for ten years. This movie is glorious. All I can say is, you will not be expecting what happens.” Lucia F. adds, “I can honestly say that it is one of the most exciting and enjoyable movies I have ever seen. I was dazzled by this enormous spectacle of a movie. There are so many surprises, laughs and even sad moments. The production values, acting, special effects and writing are top-notch, of course.” KIDS FIRST! Adult Juror Kimbirly O. wraps it up with, “I love this film! It has all the feels. I cheered for the heroes, loathed the villains and found Thanos’ crew to be a creepy bunch. When I think about the behemoth task of directors Anthony and Joe Russo, I want to evoke the “mind-blown” emoji!” See their full reviews below. Wow! Just, wow!! Marvel Cinematic Universe has been building up to this movie for ten years. This movie is glorious. All I can say is, you will not be expecting what happens. It left me screaming inside. I still cannot believe it. 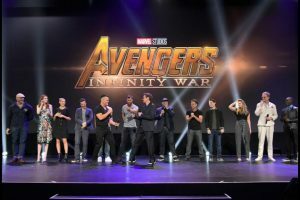 The storyline is about the Avengers and their allies needing to team up to stop the titan Thanos from collecting The Infinity Stones and destroying half the universe. Now, because all the Marvel characters are finally coming together, Marvel fans will obviously be excited. And when basically every single character appears on-screen, the theater erupts into claps and screams of joy. I always love it when a studio or company can make people feel such excitement for their characters. It’s just really cool. This movie features lots of different locations that the characters travel to. I must admit, some of these locations are absolutely gorgeous and others, totally desolate, but still incredible. I love the shots in space and on different planets, especially the snowy planet that Thanos goes to at one point. In fact, the whole movie looks fantastic. Everything – from the costumes, the camera angles, the scale, the special effects – is fantastic! I was so invested in the visuals the entire time. 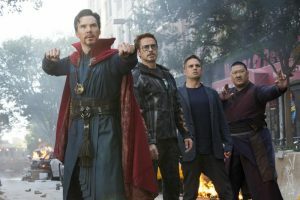 Also, let’s be honest, this is Marvel, we all expec t this movie to be absolutely hilarious. And it is. No surprises there. I laughed so hard at Iron Man and Doctor Strange arguing, Star Lord being jealous of Thor and basically all of Spider Man and Drax’s dialogue. Comedy always seems to be Marvel’s greatest strength. The writing, in general, is fantastic. I love the interactions these characters have, even the dramatic moments. That’s coming from someone who usually hates dramatic moments, because I hate being sad in movies. This is a superhero movie, so obviously there are some pretty cool action scenes. And yeah, this movie has some awesome action scenes. Probably my favorite is the huge fight in Wakanda that is shown in the trailer. The fight is absolutely massive and straight up amazing. The shots and the way the characters work together are just glorious. I felt so immersed in all the action. 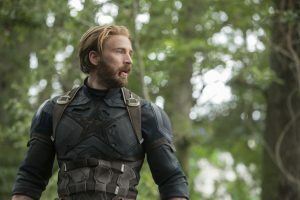 Since this movie is connected to the other Marvel movies in their Cinematic Universe, there is the possible question about whether you need to have seen all the other movies in order to understand this one. I would say, not all of them, but at least a few certain ones. I recommend that you brush up on your Marvel characters before you go, just to be ready. I give this movie 5 out of 5 stars and recommend it for ages 12 to 18, as it gets pretty dark. It opens in theaters nationwide April 27, 2018 so, check your local listings. As everyone knows, the hype for this movie was extreme. Even with expectations so high, I can honestly say that it is one of the most exciting and enjoyable movies I have ever seen. I was dazzled by this enormous spectacle of a movie. There are so many surprises, laughs and even sad moments. The production values, acting, special effects and writing are top-notch, of course. 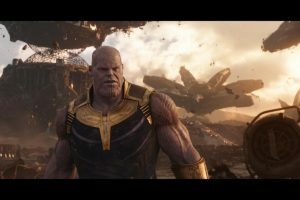 The plot of the story involves Thanos, motion-captured and voiced by Josh Brolin, who is arguably the most evil bad guy yet in the Marvel Cinematic Universe. This character is intent upon collecting all six Infinity Stones, crystals that control each aspect of existence (time, space, reality, power, mind and soul). 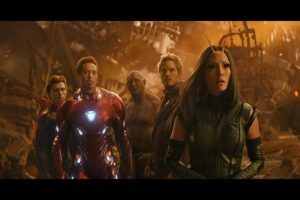 The plot involves the Avengers, the Guardians of the Galaxy and others because each of them has an infinity stone that Thanos wants. If someone gets all six stones they can control reality and Thanos, concerned about overpopulation, wants to destroy half the population of the world. 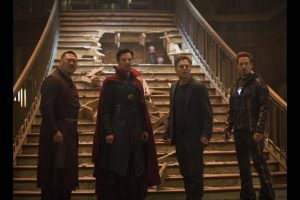 The whole team has to figure out how they can stop Thanos from getting all six stones, so they can save the world. Besides the impressive produc tion values, what people will most enjoy about this film is that it is a really funny movie. The jokes keep coming and simply don’t stop, which definitely makes for a kid-friendly film. As in every Marvel movie, the music is terrific. Alan Silvestri of Polar Express fame wrote the rousing score. Last, the realistic makeup fooled me into believing that many of the characters were bleeding. Although, it’s not really gory. I give this film 4.5 out of 5 stars for being a gorgeous and colorful blockbuster film. Of course I love everyone’s acting, especially (let’s be real) Benedict Cumberbatch, who is the best Doctor Strange. Am I right? 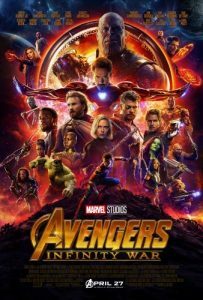 The masterful special effects, the humor and even the many surprising emotional moments combine to tell an entertaining story of how everyone in the Marvel Cinematic Universe come together to save the world. I recommend this film for ages 12 to 18. It opens nationwide in theaters April 27, 2018, so go check it out. See it! 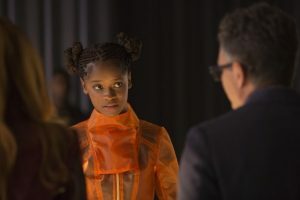 When I reviewed Black Panther, I wholeheartedly admitted I am not the target audience for the Marvel Cinematic Universe (MCU). 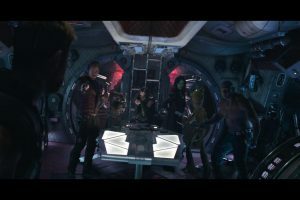 This week, as I took my seat, I STILL thought I was not the target audience for Avengers: Infinity Wars and yet I would not have traded my seat for the universe. I felt as if my old friends had invited me to visit and I loved every minute of our time together. This film rolls out like a reunion story, with old wounds and new challenges. The superhero liaisons are interesting and all the characters work together when every star system is on the line. My favorite character is Dr. Strange (Benedict Cumberbatch). Throughout the trials and travails, he is led by a moral compass. 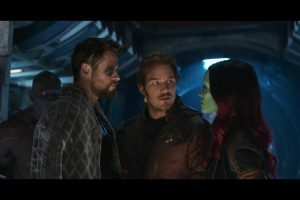 I also like seeing Thanos’ (Josh Brolin) conflict and emotion. Yes, emotion. 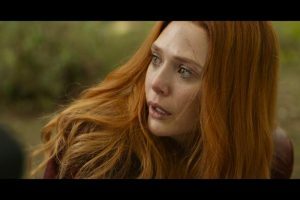 Thanos’ quest to collect all six super powerful Infinity Stones is tough to watch – especially when revealed his plans to wipe out 50% of the population. When our superheroes realize he is on a genocide quest, the action truly ignites. I love this film! It has all the feels. I cheered for the heroes, loathed the villains and found Thanos’ crew to be a creepy bunch. When I think about the behemoth task of directors Anthony and Joe Russo, I want to evoke the “mind-blown” emoji! More than 76 characters with multiple, simultaneous plotlines! The cast is immense, yet everyone has their featured and focused action. Speaking of which, the action is intense at times and the CGI creatures are wicked. The superheroes’ costumes are like old friends or your favorite shoes that you can’t wait to see again. It is rare for a summer blockbuster to truly deliver on its “epic” promise. This one delivers. I give this 4.5 out of 5 stars for the cast, special effects, life lessons, awesome comedic pop culture references throughout, make-up (men and women) and female empowerment. This film will appeal to ages 8 to 18. I caution younger viewing due to fight scenes which may be disturbing to them. Stay for the end crawl! This opens April 27, 2018 in theaters nationwide. Look for it! This entry was posted on Thursday, April 26th, 2018 at 2:03 pm and is filed under Feature Film Reviews. You can follow any responses to this entry through the RSS 2.0 feed. Both comments and pings are currently closed.